The current generation of children is, of course, allowed the luxury of sleeping in till the last possible moment. Gowri, elder to her brother, Kesav, by a few years, was naturally the responsible one, the affectionate one. The boy, approaching teenage, had been a handful ever since his boyhood days, and continued to raise a ruckus at the slightest excuse. By the time they were up, Mr. Madhavan would be ready to face the world, his lunch-box tucked under his arm, the coffee hot in his thermos, his eyeglasses askew as always, his chappals starting to wear to one side. 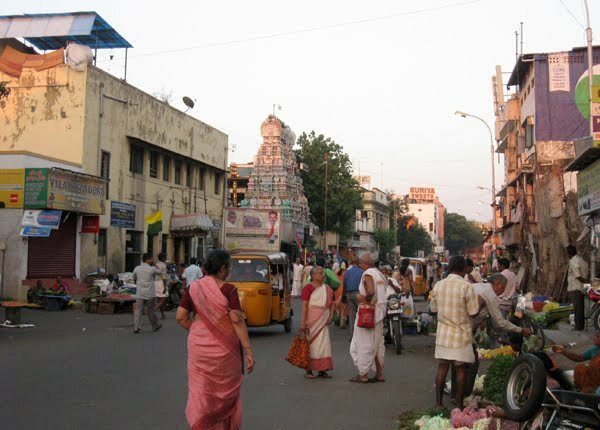 At 8 am, he would step out of his house on Kennedy Street in Mylapore, and start heading towards Luz. Heading towards Kapali Temple, he would always walk on the left side of the road until he reached Kamadhenu Theater, the reason being that he liked to gaze upon the cinema posters displayed on the walls, at the door, and at the large ones adorning the front awning. Truth to tell, he had an eye for the buxom starlets; he knew them all, by name and by vital statistics. It was his only vice, and a not-so-secret one at that. His wife used to joke with her neighbor about Mr. Madhavan’s fixations and proclivities, secure in her conviction that her husband was faithful as a hound dog. After crossing the road at the theater, Mr. Madhavan would proceed eastward until he reached the Luz Corner intersection. At that stage, a couple of quick right turns with an intervening left turn were enough to get him to his destination by 8:30 am. The time-keeper in the bank would adjust the clock to 8:30 if it showed any different time at Mr. Madhavan’s arrival. Donning the visage of a Senior Accounts Manager, Mr. Madhavan would proceed to his substantial desk and deposit his belongings precisely. A quick trip to the toilet, some brief conversations with colleagues, and he would be off and running, a huge ledger drawn in front of him for making entries. Barring a 10-minute coffee break around 11 am, he would remain engrossed in his work until lunchtime, 1 pm. He ate quickly but appreciatively, well within the allotted 30 minutes. Then, nose back to the grindstone until a brief respite at 3:15 for tea and biscuits. At precisely, 5 pm, he would rose, stretch, gather his belongings, holler out some good-bye’s, and head out the door. He would re-trace his steps, and again cross Luz Avenue opposite Kamadhenu Theater, again admiring the artwork and the anatomical details. Back home, he would be greeted enthusiastically by his wife, sullenly by his son, and rarely by his studious daughter, busy with her evening tuition classes. Some snacks to quell the hunger pangs, and he would be off again by 6 pm, on his daily walk to Nageswara Rao Park, where a few of his cronies would gather for some idle banter. Back by 7 pm for dinner, where the whole family would sit together at his insistence. The meal would be followed by some light TV viewing, with Mr. Madhavan wielding the remote control like a saber; the channel-surfing would come to frequent stops wherever the female form would be displayed, causing the family to roll their eyes furtively. He would yield control to the kids by 9 pm and retire to his bedroom, and sleep would come by 10 pm after some mild flirtations with the wife. And so it had gone till this Tuesday, when around 2:30 pm, Mr. Madhavan had a sudden urge to leave early from work. It was an impulse, but an uncontrollable one. All of a sudden, he was sick of the same old routine. Maybe it was some random talk with a colleague, or perhaps something more profound. In any case, he approached the Branch Manager with a fictitious rendering of the demise of a sick relative, and found himself free to go. As he stepped out of the bank at 2:37 pm, Lord Shiva paused for a nano-second in his cosmic dance, then recovered and danced on. Mr. Madhavan squinted into the unfamiliar light of a weekday afternoon. For a moment, he was flabbergasted. He appeared to be seeing colors that he could not comprehend, that he had no names for. He looked up into the sky, then quickly looked down, wishing he hadn’t. He could have sworn there were three suns up there… For a moment, he was tempted to retreat into the safe confines of his bank. Then, he yielded to his temptation, turned around, and pulled on the handle. He found himself, quite possibly, looking into the gaping mouth of an enormous frog with a long tongue starting to uncoil. He closed the door quickly, cursing his momentary dementia, and started to walk briskly on the… pavement? With another conscious effort, Mr. Madhavan headed towards home, where he felt he could rest up and recover his senses. But where exactly was home? The terrain was tantalizingly familiar, but the familiar by-lanes appeared to be missing. Looking straight ahead, he saw to his amazement that Kamadhenu Theater was looming straight ahead, at the end of a moderately lengthy passage. Was this a short-cut he had never noticed before, being such a creature of habit? He could scarcely believe it, but he was happy nevertheless at the comforting sight. He walked hurriedly at first, then gingerly as the floor underneath snapped at him, towards the landmark. The large posters were still there (albeit in colors beyond his visual range), the faces of the starlets now starting to appear in better definition (none he could recognize, though). As was his practice, his eyes drifted down from the face to the more interesting features… and came to a dead stop. Emotional shock can be just as deadening as physical trauma. The body shuts down affected nerve centers until the trauma passes. Hence, Mr. Madhavan was able to pretend that the theater was showing some mythological movies of a most peculiar kind, and trudge on towards home. Crossing the road took some time as the hooves thundered past. His eyes did not dare rise above floor level. Kennedy Street was approximately where it should be, and his house was more or less at the expected spot. He started breathing a little easier. What a tale he would have for his friends tonight! Blow their socks off, it would… He rang the doorbell, smiling in anticipation of the surprise in his wife’s face. Maybe he’ll take her shopping for saris, or perhaps a movie… His surly son opened the door, pleasing his father for the first and last time in his life. Mr. Madhavan stepped into the premises, his eyes searching for his dear girls. And here they came running, so excited to see him, hooves thudding into the floor, their tails wagging behind them, their faces so heartbreakingly-familiar. As their horns nuzzled him, lightly goring and teasing, and their “moos” filled the air, he slid to the urine-soaked floor and gazed upon his nearest and dearest in udder horror.